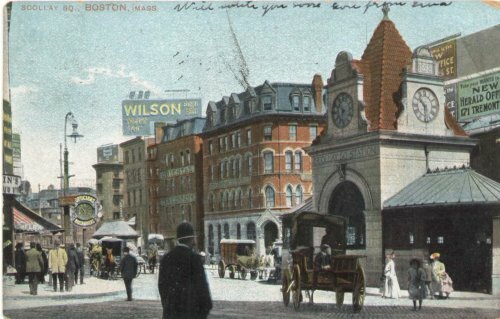 In this postcard (one that we've never seen before that we won on eBay in the summer of 2007) we see the subway kiosk and the Crawford house from the edge of Pemberton Square. 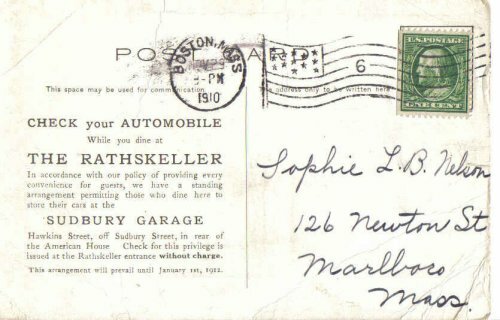 The sender indicates that he or she stayed at the Crawford house in October of 1904, and even marks the room with an "X"
Residence, 1764, and the famous Earl's Coffee House, 1806-1830.
would arrange for parking at the nearby Sudbury Garage. 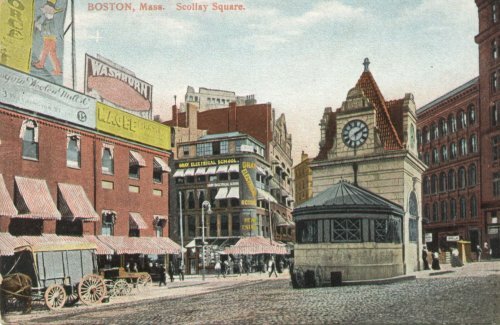 Square is the kiosk for the Scollay Square subway station. 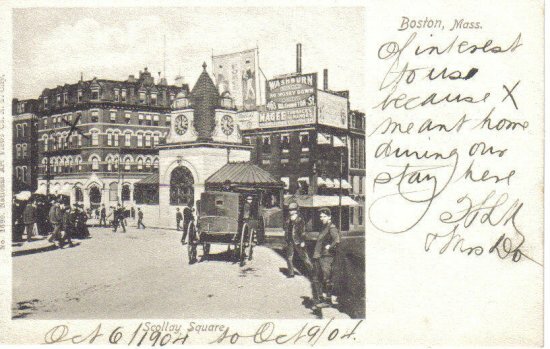 The postmark on the back of this card reads Boston, July 30, 9-PM, 1907. 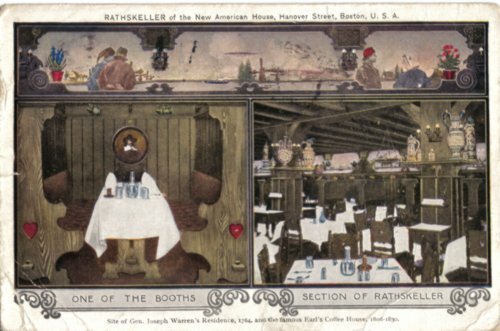 It was addressed to Miss Margaret Silver, Lunenburg, Nova Scotia. 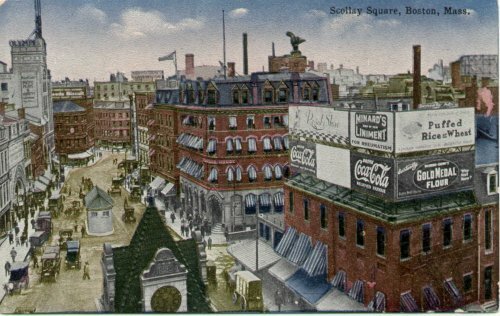 The photographer stood at the southern corner of Pemberton Square and Scollay Square and looked north. That's the Crawford House just behind the subway kiosk. 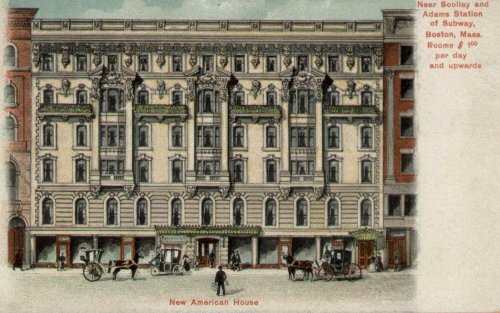 When it opened after renovations in the 1850s, the American House on Hanover Street was one of the finest in America. On the back of this postcard was written: April 6 & 7 1915, Ladies of the G.A.R. September Convention held here. A really fine aerial view of the Square after 1912. 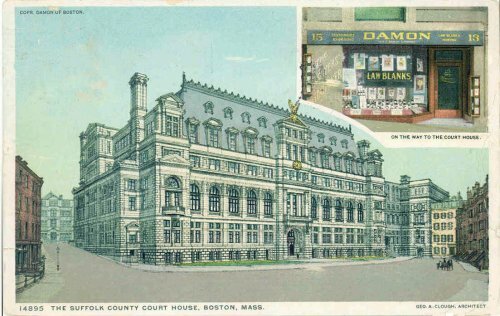 The fine, curved facade of the Theatre Comique (Boston's first theater built expressly for showing motion pictures) can be seen on the left side of the street, along Tremont Row. The tall white building further down the block is Scollay's Olympia, another theater. Diagonally across the street from the Olympia is the Crawford House (future home of Sally Keith) which we can see just behind and to the right of the peak of the subway kiosk. 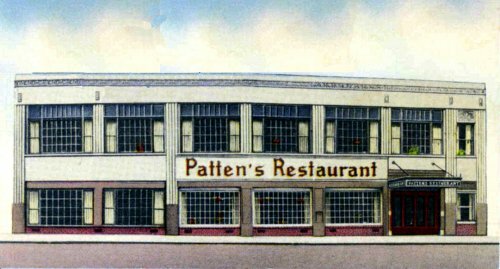 City Hall Plaza would today be on the right and 1-2-3 Center Plaza would be on the left. many lawyers who prowled the area. 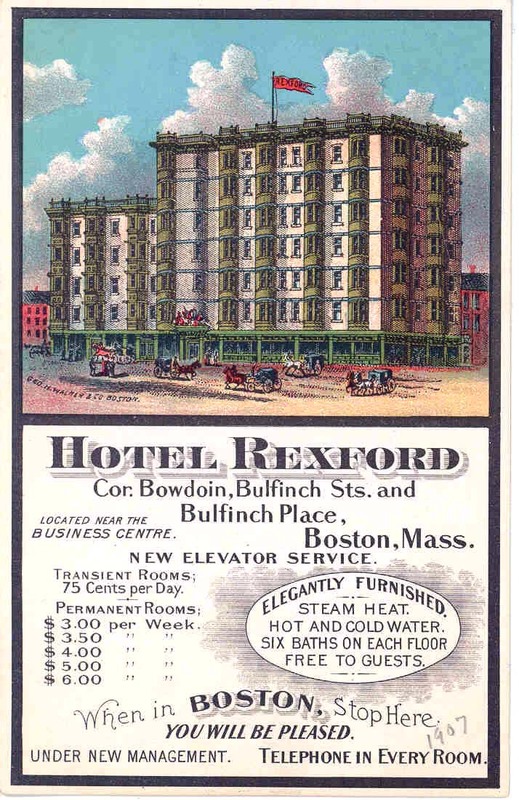 the West End of Boston, where other fine hotels, such as the Revere House, were also located.